While suicides and shock deaths have seen a sudden spike in Tamil Nadu's Cauvery delta region, the government does not believe the drought is the cause and is continuing to direct water away from rural areas. From the banks of the Kollidam river, S. Selvaraju’s farm is barely a mile away. The huge river, actually a tributary of the Cauvery that drains its surplus water into the sea, runs along the village of Anaikudy, 40 km from Thanjavur in the heart of Tamil Nadu’s Cauvery delta. For centuries, people here have cultivated three crops every year – paddy, millets, then paddy again. Over the last few years, though, several farmers have switched to cultivating sugarcane for a state-run sugar mill nearby. Some have raised banana plantations too. New cash crops partially replaced the old paddy system. Water – even if the rains weren’t good that year – never seemed to be a problem. Until suddenly it was. Selvaraju took his own life, hanging himself from a tree on his farm, after his old borewell ran dry after serving him for two decades. The new one that he commissioned just a month earlier also bore no water. The 65-year-old, who owned a seven-acre farm, committed suicide on May 5, leaving behind unpaid debts and a family – a wife and three sons – with many questions. Could he not have waited for a few more months for the rains? What was the need to kill himself? Water, says Selvaraju’s son Karti, has suddenly become a luxury in and around the village. In Kadamankudy village of Nagapattinam district, at the far-eastern tip of the Cauvery delta, a similar story unfolds. He wasn’t the right age to suffer a heart attack. Veermani was 35 when he passed away on December 30, 2016. “We were on the field; he just collapsed and died,” his widow Kavitha tells us at her small thatched hut, wondering how her husband could die at such a young age. He was fit and fine, she says, but under a lot of stress. Nothing was left on the farm – it wore a forlorn look, she says. The couple went to their farm – a 1.25-acre plot that this landless Dalit family leased for the first time from a fellow villager – to tend to the crop, or whatever was left of it. Around 4 pm, from some distance, she saw him falling. “When I rushed to check what the matter was, he was not responding,” she says. She called for help and took him to the nearby cottage hospital in an ambulance. He was no more, the doctors told her. It was, doctors told Kavitha, a shock death – something she hasn’t been able to fathom even today. 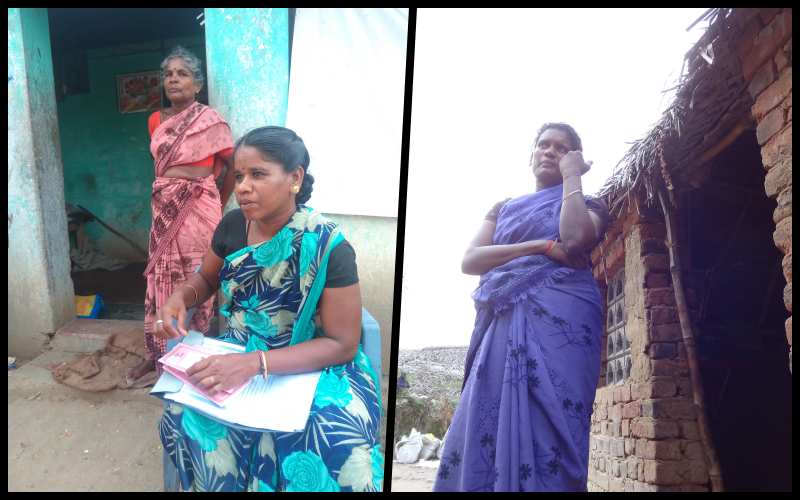 There is no comprehensive data on farmer deaths in Tamil Nadu in the 2016-17 farming season, but newspaper reports and independent inquiries by groups like the People’s Union of Civil Liberties (PUCL) and the Tamil Nadu Federation of Women Farmers Rights suggest that over 200 farmers died of heart attacks or committed suicide in December 2016 and January 2017. The sudden spike in death rates comes mainly from the delta region and sparked protests across the state, with some groups holding dramatic protests in Delhi. As many as 106 farmers were reported to have committed suicide in December, according to a notice issued by the National Human Rights Commission to the state government on January 5, 2017. 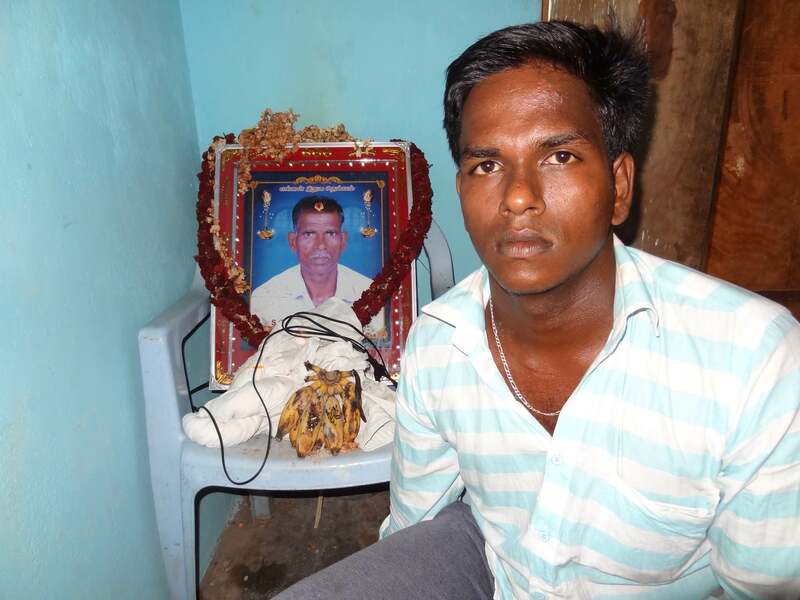 Veermani was not the only tenant farmer to have died of shock. About 25 km from Kavitha’s village is Adhichapooram, in Thiruvarur district. There, Arokyamary narrates a similar tale. No one in the family thought that T. Azhagesan, her husband, would die of a heart attack. He was only 36 years old. On November 4, his widow says, he went to his farm in the afternoon and died of a sudden shock in the middle of his wilting crops. Azhagesan, a landless Scheduled Tribe farmer, had also leased two acres of farmland. His sudden demise has thrown his family into a financial and emotional quagmire. Azhagesan’s elderly mother, Amruthavalli, is now the only working member of the family – she works as a sweeper in a nearby school for Rs 3,000 a month. These shock deaths are a consequence of emotional stress and economic troubles, says Dr Bharati Selvan, a practicing cardiologist and social worker in Mannargudi town of Thiruvarur district, once a prosperous paddy bowl in the Delta region. Selvan was part of a fact-finding team comprising farmers, social activists, students, doctors and concerned citizens who enquired into the reasons for deaths in the region. The Delta has never seen farm suicides or shock deaths before. Most of those who have died had no history of cardiac ailments; several of them were very young. “Though the government does not accept it, we have reasons to believe that a sudden emotional stress and economic turmoil could have caused these deaths,” he says. This is not like the dry and barren Marathwada or Bundelkhand or deserts of western Rajasthan – this is the highly productive Cauvery delta, a region that epitomises one of the oldest civilisations in the world, where the farmers until very recently grew three crops every year to meet local needs and send the surplus to feed the deficit in other regions. This is also not Vidarbha, where cotton farmers’ suicides aren’t abating. This is South India’s paddy bowl – the land of prosperity. When the monsoon failed, farmers this reporter spoke to in village after village in the delta region talked about failed crops, mounting debts and the lack of work. There are four months to go before the monsoon arrives in October. Selvaraju had about Rs 7 lakh in unpaid debts – crop loans from banks and loans from the informal sources that he borrowed to meet domestic exigencies. He spent at least Rs 5 lakh on two surgeries that his wife Rasati underwent for the removal of a brain tumour over the last two years. This meant recurring heath expenses. Karti says the last two years drained the family financially. Added to this were his falling assets. He sold a pair of his bullocks last year. All the family’s gold has been pawned to a jeweller in Thanjavur, Karti says. Bank savings are gone. The only possession they have now is the home he built. Selvaraju’s situation is symbolic of the average Anaikudy farmer. The drought has begun to bite. Tamil Nadu is not known for farmers’ suicides. The 2015 report on accidental deaths and suicides in India from the National Crime Records Bureau (NCRB) says that while Maharashtra (3,030), Telangana (1,358), Karnataka (1,197), Andhra (516), Madhya Pradesh (581) and Chhattisgarh (854) were the top states in terms of farmers’ suicides, Tamil Nadu that year counted only two farmers suicides, a fact contested by activists on the ground. The state however recorded 604 farm labourers’ suicides the same year, the NCRB data shows, while 1,261 farm labourers in Maharashtra and 709 in Madhya Pradesh took their own lives. A closer analysis shows these may actually be suicides by tenant farmers. The PUCL inquiry says most of these deaths are the fallout of crop losses and mounting debts. The Tamil Nadu government says these deaths have no correlation with the prevailing agrarian distress – even though 21 of 32 districts in the state have been declared drought affected and there’s no other reason for a sudden wave of shock deaths in such a short period of time. The usual northeast or receding monsoon, which sweeps across Tamil Nadu, coastal Andhra Pradesh, south Karnataka and Kerala between October and December, failed in 2016-17. The state registered an overall deficit of 60% in the south-west and northeast monsoon. Tamil Nadu reported a drop in the winter sowing of rice by well over 30% and production by more than 60%, according to the estimates. About 35 lakh hectares of land suffered from drought in the state, according to the Integrated Drought Severity Index that is developed by the International Water Management Institute, Sri Lanka. The delta, until two decades ago, was a three-crop region – mostly irrigated by its fantastic network of surface water canals branching out of the Cauvery and her umpteen tributaries. In 20 years, water shortage brought the region down to two crops and pushed the borewell frenzy. By the state government’s estimates, including data on subsidised power pumps, the delta today has close to two million borewells, sinking deeper and deeper to reach groundwater. The year gone by was the first time in a century that the delta farmers could not handle even one crop, due to failed monsoons and the non-release of Tamil Nadu’s share of Cauvery waters by Karnataka owing to a drought in the upper catchment areas and a gradient drop in the groundwater table, says Ranganathan, who heads the Cauvery Delta Farmers’ Welfare Association. As one travels across the region in the simmering heat, the signs of distress are obvious. Work is hard to come by and migration has increased. The last five years, Selvaraju spent a lot of money on Karti’s engineering education. “My two brothers did not study much, so he would nudge me to study,” he says. The eldest son Kavaskar, 35, is married and has taken to farming; the youngest Illayaraja, 19, is a school dropout and works for daily wages when he’s not helping on the farm. Karti says he earns a salary of Rs 20,000 in Singapore – which is just about sufficient to pay his bills in that country. He lives with ten other employees in a room. Last year, Selvaraju had to support Karti with a couple of lakh rupees to get a job and fly to Singapore. Where did the money come from? “He borrowed,” the son says nervously, his voice choking. From paddy, which needs a lot of water but does not give huge returns, Selvaraju switched to sugarcane in 2012, since a lot of other farmers with irrigation facilities were shifting to that crop, Karti says. The problem that they didn’t see coming, though, stemmed from mismanagement at the sugar mill. The sugar mill, run by the Tamil Nadu Sugar Corporation, has been facing financial problems, which led to delays and non-payment of cane dues to many farmers. For two successive years, Selvaraju sold his sugarcane to the mill but got no money against it. The total money due to be paid to him by the mill is around Rs 8 lakh – non-payment to cane growers is now a big political issue in this part. It was their money and yet they could not access it, his son laments. “He would go with other farmers regularly to the mill to enquire about their payments and would return disillusioned,” Karti says. This year, when the rains failed, Selvaraju dived into his groundwater resources. 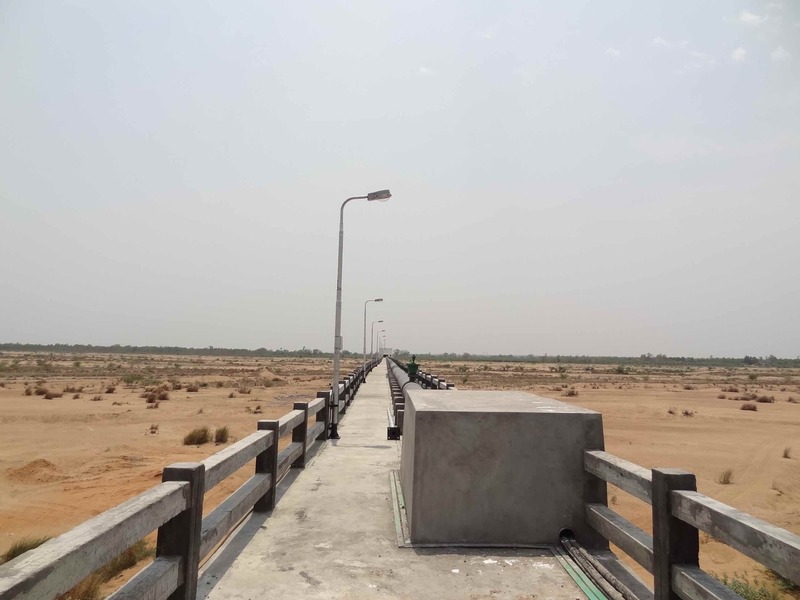 Kollidam was dry as a desert; this was the first time in many years that it did not see water released from the upstream for even a day, Anaikudy villagers say. Apparently the groundwater table too receded by several metres in this part and has now been labeled “critical” by the state’s groundwater development agency. There’s a reason for that. For years, the staggered release of water from the upstream Karnataka into the Cauvery has badly affected the delta, the tail end of the basin. It has affected the drinking water supplies of the towns and severely hit the canal irrigation network. Usually, the groundwater would be recharged automatically in this part as the Kollidam waters brought the Cauvery surplus and the north-east monsoon brought a good amount of rains. But now that cycle was broken. When Selvaraju tried to access groundwater and his old borewell ran dry, he decided to gamble on a new one, like many others did. The new one, his son says, didn’t yield any water even at 400 feet, forcing him to call off the digging. The reason is obvious: the state’s public works department has dug deep borewells right in the middle of rivers all over the delta, including the Kollidam, to siphon out water from beneath the riverbed and supply it to the big towns and cities, including Thanjavur. The villages are left dry. Today’s Selvaraju’s farm has standing sugarcane crop on half his land. Given the lack of water, it’s not doing well. The rains are still four months away. “My father sounded anxious and tired when I last spoke to him, just a day before his death,” Karti says. Jaideep Hardikar is a Nagpur-based journalist, writer, researcher, volunteer and author of the book A Village Awaits Doomsday.